Emperor tetra is a beautiful and attractive tetra fish with extended noticeable fin and tail which stands out in a planted aquarium. Emperor tetra is a peaceful schooling fish for planted and community aquariums but males tend to be aggressive while spawning. They should be kept in groups of more than 3 per group with equal number of males and females if possible. 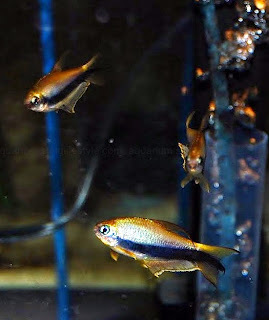 Emperor tetra fish prefer slightly acidic water for optimum health conditions. If the water quality is maintained and treated with live food, they will spawn easily and live longer. Males has long fin rays in caudal and dorsal fins. Mature healthy females have round belly with short fin rays which is very evident when compared to males. Easy, with a pair separated to a breeding tank. They spawn on the substrate or on spawning mob . They scatter eggs in the bottom and if not separated they will eat their own eggs. Eggs will hatch within 24 – 30 hours.